If you missed it, I urge you to listen to it. It underlines for me what a wicked arrogance we display when we in the non-disabled community decide that disabled people’s lives can be disposed of, whether at the beginning or nearing the end of their existence. Listening to it has prompted me to re-post here something which I wrote about my own daughter for the Faithwriters weekly challenge 7 weeks ago. The brief was to write a piece in any genre of between 150 and 750 words on the topic of achievement. Here is what I wrote. There were sounds a-plenty, but none that could be called speech; it was hard to tell if they signified anything. As she grew from baby to toddler, I was convinced that she could understand, even if she couldn’t respond or initiate conversation. If I said, “Close the door,” she would roll across the floor and push it shut with her little body. This gave me real hope that perhaps the doctors were wrong, and she had more intelligence than they had thought. The first hint of her musical ability came at a very early stage. She would sit in her bouncing cradle, staring expressionlessly into the distance, humming frère Jacques, the tune played by the toy on her cot. What I didn’t appreciate then, and only realised later, was that she was humming it in the same key as the toy on her cot. The “wow” moment came the first time she encountered a piano. She was two years old. She poked the keys tentatively with her good hand, listening to the sounds they made. And then without hesitation, she played frère Jacques, note-perfect, still in that same key. After that I was determined to unlock whatever was inside her. Teachers came to the house every week to help me do it. We decided to tackle numbers. Although she still didn’t speak, she could soon point to piles of the right quantity of bricks when given a number from one to five. Next we decided to try colours. For a week she was only allowed to wear red clothes, only allowed to play with red toys, only allowed to paint red pictures and only allowed to eat red food. We were big on tomatoes and strawberries that week, although it’s amazing what you can do with a bottle of cochineal – red rice, red custard, red mashed potato….. Week by week we worked through the colours, and soon she could select the asked-for colour from a variety that we offered. It wasn’t until she was five that the words began to come. The first word she ever spoke was “cake”! That was followed by “dad”. Monosyllables were all she managed for a long time. One of my happiest moments followed not long after. Her older sister was teasing her mercilessly, and, unable to get up and leave as any other child could have done, she lay there growing increasingly annoyed. Finally the frustration had to erupt, and she shouted, “Shut your face!” It was so appropriate in the context that I knew, whatever the doctors said, that the wordless exterior concealed a lively intelligence. One day she came home from school and hesitatingly, haltingly, began to recite a nursery rhyme she had learned. I realised that if she could memorise nursery rhymes, she could memorise God’s word. So I sat down in front of her and asked her to repeat a verse after me, phrase by phrase. “My feet,” I went on. And that was when she astonished me. Instead of repeating, “My feet,” she finished the verse: “from stumbling.” All those years that I had read the Bible to her, she had been taking it in, though she’d had no way of letting me know. People abort unborn babies just because they have some kind of disability. If you point out that this is just another form of disability discrimination, the argument is sometimes put forward that it isn’t fair on the parents to have their lives ruined by having to raise a child with such challenging difficulties. To this I would reply that yes, the difficulties are challenging. But the rewards, when the child achieves something you have been told they will never manage, go way beyond anything parents of simply “normal” children will ever experience. And who are we to deny a baby the chance to climb that mountain of effort and reach adulthood with a far greater sense of achievement than their peers? There’s just one problem. When I moved here six months ago the lawn was twelve inches high and consisted as much of dandelions, buttercups, dock leaves and stinging nettles as of grass. I covered it with weed and feed and the weeds have started to die back, but not before leaving last season’s seeds all over the garden. In all the flower borders cotyledons are beginning to open out on the surface of the soil and I find it impossible to tell which ones are the seeds I planted and which are the weeds. At this stage they look so similar that I don’t have the confidence to start weeding them out for fear of uprooting the plants I’m hoping will fill my borders by the summer. This is one of Jesus’ parables of the end times, looking ahead to what will happen when He returns to establish His reign of justice and peace. But like so many of Jesus’ stories, it has different layers of meaning. I look at my own life, and I can see some things which God has planted and which are flourishing. I see other things which, frankly, are shrivelling up and need a good watering from the well of the Holy Spirit. But I also see new things beginning to germinate. Some of them worry me. Is this one a trait God wants me to develop? Is it something He’s going to use in my life? Is it going to grow into something that bears fruit from which others can be fed? 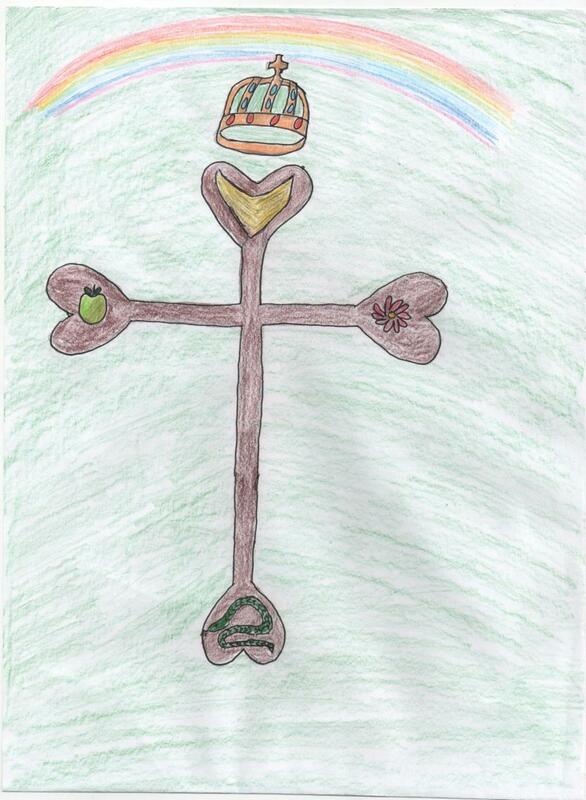 Or is it something insidious that will spread its roots invisibly around the things God wants to grow and choke them? It’s not always easy to tell. Am I becoming less anxious, more restful, more trusting of God? Or is my natural tendency to laziness reasserting itself when I should be expending energy in pursuit of what God wants for my life? It can sometimes be hard to distinguish. Am I learning to relate to God in everyday life instead of religiously following the patterns of my upbringing (e.g. you must get up early every morning to have a “quiet time” – this is the foundation of Christian living)? Or can I just not be bothered to get up early and spend that time with Him at present? Am I becoming more sensitive in my dealings with those who don’t yet know Jesus personally? Or have I lost my passion and boldness in sharing the Gospel? At the moment these are questions I genuinely don’t know the answers to. Some of them could be applied to the church, too. As God gently dismantles the structures we have been used to in church life and shows us a new way to be as the Body of Christ, He is sowing many new seeds that are going to result in greater fruitfulness, increased unity and love, deeper maturity. But in among all of that there are bound to be some things that will not be helpful, new ideas that don’t move us on in our journey from vision to reality. And it can be very hard to distinguish one from the other. It would be very easy to go round uprooting things left, right and centre, both in my own life and in the life of the church, with the attendant risk that we remove or damage the burgeoning seedlings that God wants to grow in us – or worse still, remove His sowings and leave the weeds to flourish. I’m itching to start ripping things out of the soil in my flower borders, but I’m restraining myself until they grow to the stage where it’s obvious what they are and which ones need to be removed. That could take many more weeks yet, and the process takes patience and trust – I have to set aside any anxiety and believe that the weeds will not be allowed to strangle the plants I’ve sowed. In my life, too, I’m trying to learn to trust things into God’s hands and wait patiently for the moment when He begins to say, “Now you can see why that one is not helpful and needs to come out, and now you can see why that one is going to be a real blessing to you and others and needs to be watered and fed.” In the meantime, I have to listen to Him, allow His rain to water my life, drawing constantly from His well of supply, and basking in the sunshine of His presence. Soon enough it will start to become apparent what adjustments I need to make and what I need to abandon in order to pursue His agenda. The same is true in church life – we can trust the Holy Spirit to show us when and how to uproot something that’s growing where it doesn’t belong, and how best to water the emergent fruits that will turn His church into a source of beauty and nourishment for the community in which He has placed us. This afternoon I visited Winchester Cathedral to enable my daughter Natasha to complete some drawings for a project on religious art. While we were there I went, as I always do, to make my pilgrimage to the tomb of Jane Austen. She is probably one of the writers who has most influenced me. Whether or not you enjoy her stories, no one can deny that she is a past-master at creating lifelike characters. I read once again the familiar inscription on her tombstone, and noted, as I always do, how its final paragraph grated on me. But it struck me today – Easter Saturday – that this weekend of all weekends, there is a good reason for pondering those words and asking if they ring true. 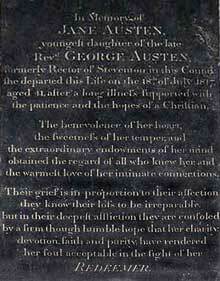 In Memory of Jane Austen, youngest daughter of the late Revd George Austen, formerly Rector of Steventon in this County. She departed this Life on the 18th of July 1817, aged 41, after a long illness supported with the patience and the hopes of a Christian. The benevolence of her heart, the sweetness of her temper, and the extraordinary endowments of her mind obtained the regard of all who knew her and the warmest love of her intimate connections. Their grief is in proportion to their affection, they know their loss to be irreparable, but in their deepest affliction they are consoled by a firm though humble hope that her charity, devotion, faith and purity have rendered her soul acceptable in the sight of her Redeemer. To these accolades we could add her faithful trust in God throughout dashed hopes of love and marriage, and her patient fortitude in the face of a painful, prolonged and early death, possibly due to Addison’s disease. But whenever I read this, I ask myself whether it was Jane’s “charity, devotion, faith and purity” (irrefutable though they were) that rendered her acceptable in the sight of her Redeemer. And in the Easter story, I believe we have the answer. Crucified alongside the Lord Jesus there were two thieves. One of them, by his own account, was being crucified “justly, for we are receiving what we deserve for our deeds”. He had nothing to recommend him to Jesus; certainly nothing that could be described as “charity, devotion, faith and purity”. Jesus’ response might have been, “After the life you’ve lived? You have GOT to be joking!” If personal virtues like Jane Austen’s were necessary to make us acceptable to our Redeemer, this is what He would have had to reply. But see what He actually said, without hesitation: “Truly I say to you, today you shall be with Me in Paradise.” This is not just good news; this is absolutely amazing news for people who, like me, have not attained Jane Austen’s heights of saintliness. Even without a catalogue of good deeds, this man was acceptable to God, not because of what He had done, but because of what his King was doing at that very moment. I am well aware that I fall short of the example of Christian living that I see when I read biographies of Jane Austen. I also think I maybe compare pretty favourably with the thief who was crucified next to Jesus. But thank God, I am not assessed in relation to either of these standards. I am acceptable to my Redeemer because He made me, and He loved me enough to rescue me by giving me His own righteousness, even when I had fallen hopelessly short of His glory. It’s a popular slogan, but it’s nonetheless true: Jesus thinks I’m to die for. And how I wish there had been some other way. that His humble head need not have endured the rod. filled with sickening mirth at the way He died. had never been forged; that no axe had felled the tree. need not have been stained with the blood He shed for me. And did they have to mock and despise Him so? the humiliating taunts, the jeering shout. And how I worship Him with a grateful heart. And what can I say in response to a love like this? not with a traitor’s, but a lover’s kiss.